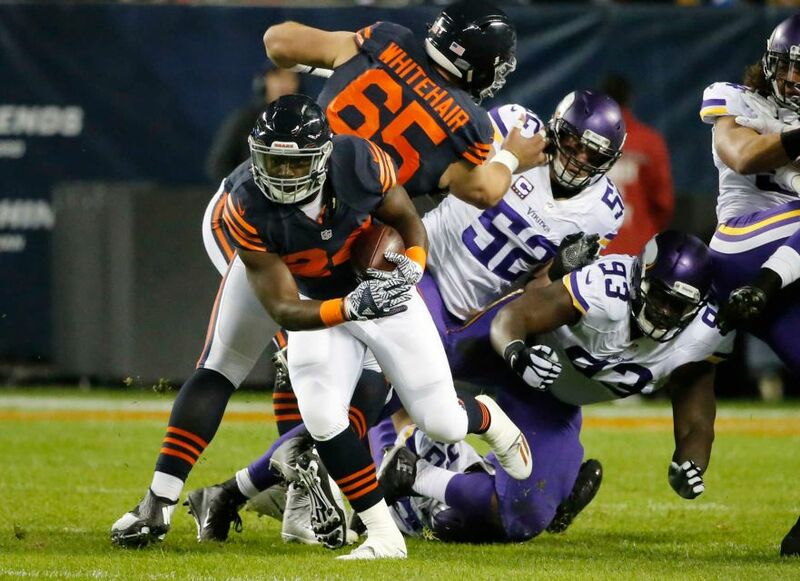 The Bears had the biggest trick on Halloween night defeating, the NFC North division-leading Vikings, 20-10 in Soldier Field. Now the Bears will head into the bye week hoping to get some key pieces healthy. From the very beginning, the Monsters of the Midway made their presence felt – the defense held the Vikings’ offense to 2 of 13 on third down conversions. This allowed the Bears front seven to unleash havoc on Vikings quarterback Sam Bradford. The unit registered five sacks – Akiem Hicks had two, and Leonard Floyd, Pernell McPhee, and Cornelius Washington each had one. The constant pressure rattled Bradford and made him unable to connect with his receivers down the field. It wasn’t just the defense that played a phenomenal game. Rookie Jordan Howard was a huge factor on offense as he ran all over the Vikings No. 1 ranked defense. Howard accounted for 202 total yards – which included a career long 69-yard run. The rookie out of Indiana wasn’t afraid of the Vikings furious defense. He remained patient and allowed his offensive line to create holes. With starting pro bowl guards Kyle Long and Josh Sitton out it was a concern whether there would be holes for Howard. But, Eric Kush and Ted Larsen filled in and did a magnificent job along with the rest of the offensive line in clearing a path through the Vikings’ defense. The offensive line also gave Bears quarterback Jay Cutler plenty of time to make the correct reads and move the offense down the field. Cutler was only sacked once and finished with 252 yards, one touchdown and a 100.5 passer rating. It was clear the Bears missed Cutler’s playmaking ability as he was able to keep the offense on the field with his athleticism. On third and eight early in the second quarter, the pocket collapsed around Cutler, he stepped up, eluded the pass rush and made a shovel pass to Howard for 34 yards – keeping the drive alive. That drive ended in a Connor Barth field goal. Barth was perfect on the night going 2 for 2 on field goal attempts. It was a collective effort on all sides of the ball that helped the Bears secure their second win of the season against NFC North opponents and also the Bears second home win. The Bears only had one win against the division and at home a season ago. The Bears now will head into their bye week, hoping that the injury report will have far fewer names on it. Players like starting nose tackle Eddie Goldman, cornerback Bryce Callahan, and veteran receiver Eddie Royal should be healthy for the November 13th matchup against the Buccaneers (3-4). After the Buccaneers the Bears will face the: Giants (4-3), Titans (4-4), 49ers (1-6), Lions (4-4), Packers (4-3), Redskins (4-3-1), and Vikings (5-2). The Bears have Cutler back under center, will get healthy after the bye week and have a favorable schedule, maybe it’s not the time to give up on the season … just yet. Let’s see what other tricks the Bears have up their sleeves. Did you miss our Week 8 postgame show?